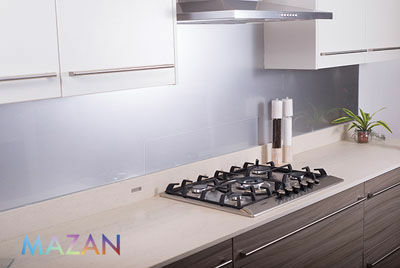 Mazan® by Blackheath Products is a beautifull collection of acrylic glass panels and splashbacks suitable for domestic and commercial use. As an alternative to glass, Mazan is an affordable option and comes in a standard range of diverse solid and metallic colours with a thickness of 4mm which gives a wonderful intensity of colour. As colour-matching is important in any interior design, Mazan is also available in any RAL colour, so you can match your décor perfectly. For anyone who would prefer something unique, Mazan can be tailored for you using your digital imagery – any image can be supplied (subject to the right high definition) or for stunning modern signage. Mazan® is environmentally friendly as it uses much less energy than traditional glass during its production and can also be recycled. Easy to clean (warm water and a microfibre cloth). Strong chemicals are not required as germs will not develop on its clean surface due to it being 100% waterproof. Repairable – Mazan acrylic glass has an excellent resistance to ultraviolet rays from the sun, and scratches, but if an unlikely scratch or scuff occurs, these marks can be polished away. Back-painted surface 4mm Acyrilic Glass Mazan is kind to the environment. It uses much less energy than traditional glass during its production and can be recycled. Mazan panels are protected throughout the installation due to both the front and back surfaces having a removable protective film. Only once the panel is installed, is the front protective film removed. Mazan can be thermoformed by specialist fabricators to create shapes and curves ranging from the dramatic to the subtle to bring a seamless, unique quality to your design. Mazan comes with a 10 year limited warranty. Please refer to the ‘Care and Maintenance Guide’ for more details. Where Can I Fit Mazan®? As Mazan acrylic glass is 100% waterproof, it is perfect to install in domestic kitchens and shower rooms as well as commercial areas such as washrooms, receptions and offices. In the bathroom, Mazan makes a perfect shower wall, splashback and colour matching bath panel. In bedrooms, Mazan can be used as a door surfacing material for cupboards and wardrobes. It can be used commercially as splashbacks for wash hand basin units, wall plumbing panels and modesty screens. For a great impact in public areas such as cinemas and arenas, Mazan can be used to create an attractive space that people will want to return to, by simply combining Mazan mirror finish panels with lighting cleverly positioned to reflect the solid and metallic colours. Blackheath’s amazing new digital print range enables you to create your perfect bespoke wall or splashback. Please get in touch with us for more details.